This is not a joke. It is pure evil genius. I don't really have anything else to say about it. I added some meatballs to the recipe since someone in this house (not me, ahem) likes some protein to balance out the carb overload. 1. Spray counter lightly with non-stick cooking spray (or use parchment paper). 2. Roll loaf or combined dinner rolls into a 12x16-inch rectangle. Cover with plastic wrap and let rest for 10-15 minutes. 3. Cook spaghetti according to package instructions. Drain and let cool slightly. Mix with sauce. 4. Remove wrap from dough. 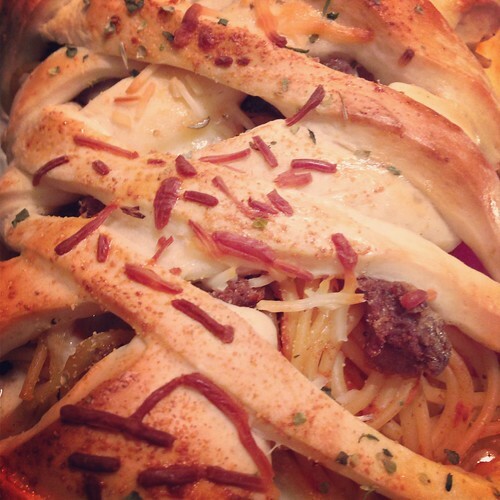 Place spaghetti lengthwise in a 4-inch strip down the center of dough. Top with cheese and meat, if using. 5. Make cuts 1 ½-inches apart on long sides of dough to within ½-inch of filling. Begin braid by folding top and bottom strips toward filling. Then braid strips left over right, right over left. Finish by pulling last strip over and tucking under braid. 6. Lift braid with both hands and place on large sprayed baking sheet. (or transfer parchment paper to baking sheet). Brush with egg white and sprinkle with Parmesan cheese, garlic powder, and parsley. 7. Bake at 350 for 30-35 minutes or until golden brown. Cool slightly and slice to serve. This looks great! My grocery store doesn't carry Rhodes bread dough. Do you think pizza dough or crescent roll dough would be better? Hi Jenna, My store didn't have Rhodes bread either. I bought another brand of frozen white bread loaves, it came 3 to a pack, and worked just fine. I'd try to find something similar- not sure how a different type of dough would work since I haven't tried it! Good luck!